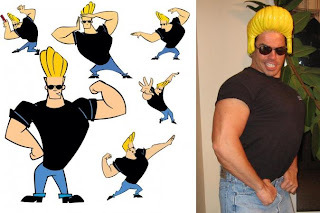 Happy Halloween from Johnny Bravo! The hamstrings are a weak link for a lot of people. But by including stiff leg deadlifts in your workouts you'll be able to fix that problem. The stiff leg deadlift is one of my favorite hamstring exercises for building strong muscular legs, because it works the hams through a full range of motion and you can lift fairly heavy. The key is to really getting the most out of it is to emphasis the stretch in the bottom portion of the lift. To do this I like to stand on a step or a box to allow for a deeper range of motion. How Would You Like Increased Grip Strength? For a lot of people the weak link in their training programs is their grip strength. I mean let's face it, your grip is what connects you to the weights for at least 80% of your exercises. The only places where your grip really doesn't come into play is with some leg and ab exercises. But for all barbell, dumbbell, cable, and most machine exercises your grip is critical. And the cool thing is that if you increase your grip strength, you'll increase your strength in virtually every exercise that requires you to grab the weights. This will really help to spur on new muscle growth all over and take your physique to the next level of strength and muscularity. Not only that but you'll also pack on some size to your forearms as well. And that is really cool because out of all the muscles of the body, the forearms are the most visible. Anytime you roll up your sleeves people are going to take notice, and if you have thick muscular forearms then that instantly shows that you are strong and have paid your dues in the gym. One of the fastest and easiest ways to quickly build up your grip and forearm strength is with Heavy Duty Hand Grippers. I've been seriously training Heavy Grippers since 2004 and I just can't say enough good things about them. But just the other day I got an e-mail from one of my customers and it really helped to drive the whole message home. I just wanted to give a little testimonial on my experience with the Heavy Grip Hand Grippers. I've been strength training on and off for years, and used to train in MMA. I initially purchased the 200 LBS hand gripper a few months back, and was hardly able to squeeze out any reps, so I demoted myself to the 150, worked my way up to the 200, and am now squeezing out 8-10 reps on the 250 pounder after just a few months. I'll be purchasing a 300 pounder soon enough, and then hope to graduate to the 350. Thanks for the excellent product. I was able to up the weight in my kettlebell training due to my increased grip strength. 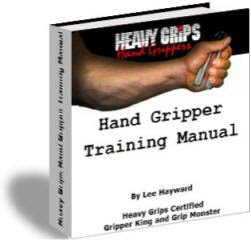 And for a limited time I'm also giving away a killer Hand Gripper Training Manual that shows the exact gripper workouts I personally followed to develop the hand strength to close the Heavy Grips 350 pound hand gripper in just 3 months! Nutrition Or Training - Which Is More Important? The first thing I would say is that you cannot separate nutrition and training. The two work together synergistically. Regardless of your goals - gaining muscle, losing fat, athletic conditioning, whatever -you will get less than-optimal or even non-existent results without paying attention paid to both. Except for the changes that need to be made between an "off season" muscle growth diet and a "precontest" cutting diet, the diet won't and can't change much - it will remain fairly constant. 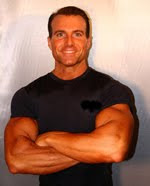 Tom Venuto is a lifetime natural bodybuilder, an NSCA-certified personal trainer (CPT), certified strength & conditioning specialist (CSCS), and author of the #1 best-selling e-book, "Burn the Fat, Feed The Muscle." Fat Burning Secrets of the World's Best Bodybuilders and Fitness Models. In this video I cover the classic 20 rep squat program. Also known as "Squats and Milk" by a lot of the old time bodybuilders. This is a killer workout that will literally force your body to grow like nothing else. This is a delicious, high protein, low carb, chocolate peanut butter muscle building brownie recipe that one of my buddies shared with me the other day and it is awesome! A great tasty treat that you have have on either a fat loss diet or mass building bulk up program. 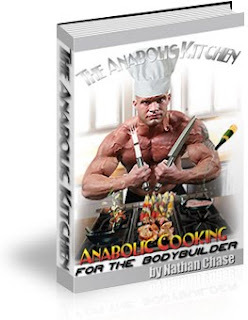 This is an awesome "Bodybuilders Cookbook" that covers over 300 delicious muscle building and fat loss meal ideas that you can make yourself. Everything from gourmet dinners to a high protein healthy dessert treats. this workout that I posted today is just that. killer chest workout done in about 30 minutes flat. and nutrition strategies for getting lean and ripped. So be sure to tune in and check it out tonight at 9pm EST time! This is a complete shoulder workout routine that targets all 3 heads of the deltoids. Seated dumbbell presses for overall mass, then side lateral raises to isolate the side deltoids, bent over dumbbell flyes to hit the rear deltoids and upper back, then do plate raises for front deltoids, and finish up with Bradford presses to really burn out the shoulders. If you have a stubborn chest that just refuses to grow, then try out this killer muscle pumping super set combo of pec dec flys and push ups at the end of your chest workouts to really pump up your pecs and help spur on some new muscle growth. This is the LAST DAY that you can take advantage of the special promotional offer and get a FREE copy of "Blast Your Biceps" with your order of "Muscle Specialization Secrets". 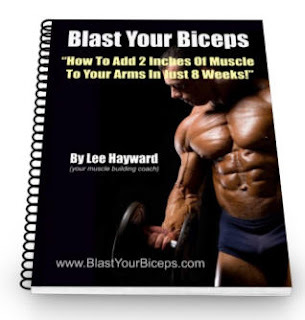 Place your secure order and then e-mail me at: lee@leehayward.com with your name and receipt number and I'll send you a copy of "Blast Your Biceps" for FREE! This offer is only available until mid-night Saturday October 10 on a first come, first serve basis. 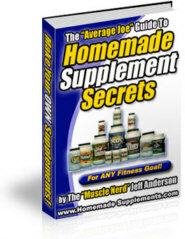 So you should go on over to www.MuscleSpecializationTraining.net now and get your copy of this muscle building mega-pack before they are all sold out! Do you suffer from a nasty case of SNAS? have always been my most stubborn bodypart. No matter what I did they just would not grow for me. workout routines just won't cut it. guns and help cure the dreaded "Spaghetti Noodle Arm Syndrome"! and they're almost SOLD OUT! is so very DIFFERENT from anything else you've seen. But Jeff's shares a training concept called "micro-targeting"
by zeroing in on those muscles with a unique training approach. The secret to overcoming "Spaghetti Noodle Arm Syndrome"
most visible both from the FRONT and the SIDE. PRESSDOWNS where your palms are facing UP. elbows and SQUEEZE your outer triceps hard for 1-2 seconds. High volume sets of 8-12 reps will help you get the "pump"
you're looking for to increase mass. more on the INNER head of the biceps and go for "width". that zeros in on the inside area of your bi's. weight to do 8-12 reps.
the other side where your body would normally be. Next... take a WIDER than shoulder width grip on the bar! This is a simple... & POWERFUL tactic to hit your forearms HARD! for you to wipe the sweat off of the machines). another 2-3 inches to the width of your grip area. this GREATLY activates your forearms in these movements! Using this for exercise #1 above will work more of the "top"
work more of the "underside" of your forearms. balloon up in no time! every single area of your body?! 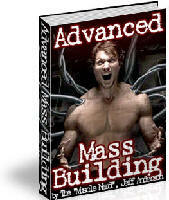 ==> 6 Audio CD's on "Muscle Specialization Secrets"
(or when the boxes all sell out). "Muscle Specialization Secrets" program by October 10. 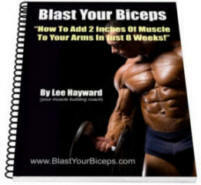 Get A FREE Copy Of "Blast Your Biceps"! as 2 inches of solid muscle mass to your arms in just 8 weeks! And tonight I'm going to tell you how you can get a head start and get a F-R-E-E copy of "Blast Your Biceps" before anyone else. So be sure to tune in live tonight October 8 at 9:00 pm EST. I'm looking forward to chatting with you then! What the PRO'S know that YOU don't! results from your muscle-building efforts. top level athletes train all year long for their "event season". that one time when they have to be at their very BEST! Well, what's YOUR "big event" for the year? - Is it to get ripped for that beach vacation next summer? - Is it some sporting event that you want to dominate? an ex-girlfriend jealous because you are in such awesome shape? your workout efforts RIGHT NOW! How To Cycle Your Training For Max Results! while trimming off some of that xmas holiday blubber. by building muscle while burning fat at the same time. when trying to get to low body fat levels too fast..
if you want to get to very low body fat levels. cardio workouts to help preserve muscle while burning fat. Don't freak out about your waistline! you strip off the fat again for next summer! to the one or two areas you most need the work. for the big summer time "lean out". you may be "out of balance" with how your body looks. ==> Is your CHEST to flat? divert your body's mass-building efforts to that region. muscle group of your choice. to add more SIZE and bring it up to "showcase" level! you bring up lagging body parts FAST! When they're gone... they're gone for good! The "Real" trick to getting Six-Pack Abs? Do you wanna know the "Real" trick to getting Six-Pack Abs? is to "burn off the fat", right? You want to tell me that you "already HAVE a 6-pack"
but it's just covered with a layer of blubber? only to find that they still don't have any abs! mid-section in order to achieve that lean "ripped" look! at 10% body fat or at 6% body fat. single digit bodyfat levels will tell you! then all the better... easier abs for you! still see them even if they aren't super shredded. just like ANY other muscle... with RESISTANCE! Find yourself a DECLINE BENCH and a bath-sized TOWEL. Roll the towel up into a cylinder, about 6 inches high. bench and your legs straight with feet on the floor. and ALSO gives you incredible lower ab activation. Lower your legs SLOWLY but don't give them a break at the bottom. out decline bench leg raises until muscular exhaustion. legs at the knees and keep going with "reverse crunches"
in the same fashion, bringing your knees up toward your chest. Give it a try in your own workouts! the results you'll see in just a few weeks. some advanced training tips for EVERY MUSCLE GROUP? Learn How To Zero In With "Sniper-Like Precision"
Vein-Popping New Muscle... Practically ON DEMAND!